'Thunderbirds' TV Show Creator Gerry Anderson Dies At 83 : The Two-Way Gerry Anderson, the man who created the iconic TV series Thunderbirds in the 1960s, has died, the BBC reports. Anderson, whose work was honored by a special set of moving-image stamps in Britain last year, had suffered from Alzheimer's Disease. Gerry Anderson, the man who along with his wife Sylvia created the cult-favorite TV series Thunderbirds in the 1960s, has died, the BBC reports. Anderson's work was honored by a special set of moving-image stamps in Britain last year; he had suffered from Alzheimer's Disease, which he spoke out against this past summer. Anderson died in his sleep around noon Wednesday, according to his son Jamie, one of Anderson's four children. Thunderbirds creator Gerry Anderson has died at age 83. 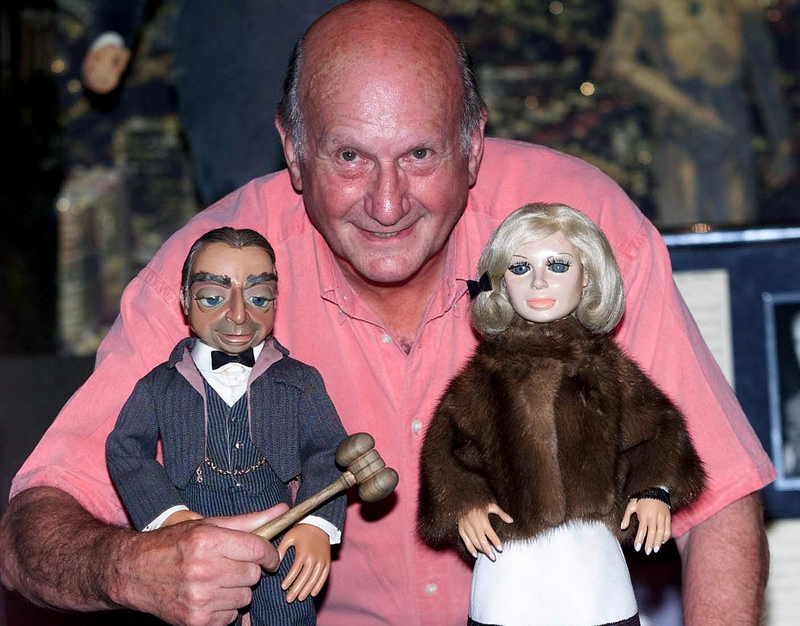 Here, he poses with puppets Parker and Lady Penelope from the series, shortly before a 2001 auction in London. After making their British TV debut in 1965, the marionette puppets of Thunderbirds — five members of the Tracy family, along with Lady Penelope and her butler, Parker — became a sensation that won international audiences with high-tech tales of adventurers rocketing around the world, and even into space, to fight evil-doers. The series was produced for only two seasons on Britain's ITV. But it was later picked up for syndication by TV stations in the U.S., where it became a staple of Saturday-morning programming for a generation of children. Anderson's iconic visual style and use of "Supermarionation" and scale modeling were seen as technical landmarks in TV and film production. His main designer, Derek Meddings, went on to create visual effects for films in the James Bond and Superman franchises of the 1970s and 1980s, among other work. "To those who met him Gerry was a quiet, unassuming but determined man," said Nick Williams of the Fanderson fan club, in a statement posted online by Jamie Anderson. "His desire to make the best films he could drove him and his talented teams to innovate, take risks, and do everything necessary to produce quite inspirational works. Gerry's legacy is that he inspired so many people and continues to bring so much joy to so many millions of people around the world." In addition to Thunderbirds, Anderson created Stingray, Captain Scarlet and the Mysterions, and the live-action series Space: 1999. As recounted on the Fanderson site, Gerry Anderson was born in London's Hampstead area in 1929. After his early dreams of becoming an architect were dashed by the realization that he was allergic to plaster, he then developed an interest in, and talent for, film and advertising work. He eventually founded his own TV production company. The success of Thunderbirds led Anderson to create two feature films: Thunderbirds Are Go (1966) and Thunderbirds 6 (1967). After its cult status was bolstered by years of running in syndication, Thunderbirds was remade as a U.S. live-action film in 2004. In the same year, it also inspired the film Team America: World Police, in which South Park creators Matt Stone and Trey Parker used puppets, musical vignettes and a striking palette of profanity and sarcasm to depict a team's efforts to quash the dastardly plots of terrorists that included late North Korean dictator Kim Jong-il. Anderson died in a nursing home near Oxfordshire, where he was a long-time resident. Reporting the news of his death today, the Oxford Mail also noted his work to fight Alzheimer's. "Gerry Anderson has been an outstanding supporter of Alzheimer's Society and campaigner on behalf of people with dementia," the paper quotes Alzheimer's Society chief executive Jeremy Hughes as saying. "He was determined, despite his own recent diagnosis, to spend the last year of his life speaking out for others living with dementia to ensure their voices were heard and their lives improved."